The common denominator of all who live, work, and pass through Cedar Park is the street. Well-connected, multi-modal transportation networks affect everything from our health to household expenses to traffic injuries. Our streets are the foundation for a safe and liveable community and provide settings for commerce and social interaction. Our streets are our public square; they must be equitable, accessible, and safe for the entire community. Good transit is good for our health, the environment, and our lives. You can reach us at transit@cedarparkneighbors.org. The Cedar Park Neighbors Transit Committee is working to increase pedestrian safety and ADA access, create better infrastructure for cyclists, calm/slow traffic, coordinate with SEPTA, the City, and other community organizations, and incorporate Vision Zero strategies to achieve the goal of zero traffic deaths and serious injuries. Activities related to the following within CPN boundaries: Roadways. Biking. Street and Sidewalk Safety, Mobility, and Access (including ADA). Community Awareness, Engagement, and Collaboration around Transit. Parking Issues: Residents and Commercial. SEPTA. PWD and PPA projects. We also plan to support neighboring RCO’s on related projects and initiatives that align with our values. Safe: no traffic deaths or serious injuries. 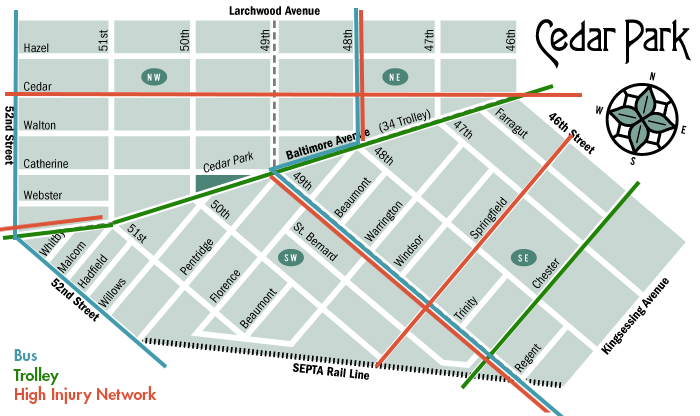 Cedar Park is transit-rich with 2 bus lines, 2 trolley lines, SEPTA rail line, and several miles of bike lanes, all centered around the Baltimore Avenue business corridor and abutting the 52nd Street business corridor. The “High Injury Network identifies corridors with highest rates of death and serious injuries. Full map here.